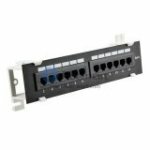 Fiber-Mart provide Category 5e Products including Cat5e Network Cables, Cat5e Patch Panel, Modular Jacks & Plugs for Cat5e. Category 5e network cabling are used to work well together for a wide spectrum of applications, including Gigabit Ethernet, broadband video, 155Mbps ATM, 100Mbps TP-PMD/CDDI, and Voice over IP. The Category 5e Products from Fiber-Mart exceed all TIA and ISO specifications for cabling systems and components, and they are interoperable with other standards-compliant products.